ISBN 825864941. Key: C major. 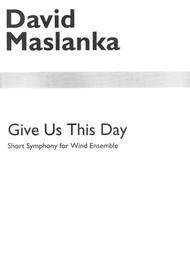 A short, two-movement symphony by the masterful David Maslanka demonstrates once again the rich possibilities of the wind band in the hands of a composer who understands the creative potential of the medium. The slow and richly scored opening movement makes especially fine use of an expanded percussion section, triadic harmony and melodies with the flavor of an incantation. The second movement is a driving Allegro with a stern, striding C minor theme that dominates the movement until the coda, which ends the piece with a slow, heaven-storming chorale. Despite the title (from The Lord's Prayer), the composer claims a Buddhist inspiration for his piece.